Baby showers are a perfect time to bless the mom to be with items they may need for the new arrival of their bundle of joy. It is a great way to surround the mom-to-be with love and support, and you might have the dad even attend! If you are on the hunt for the perfect theme or decor, I have 20 awesome baby shower theme/decor items below. 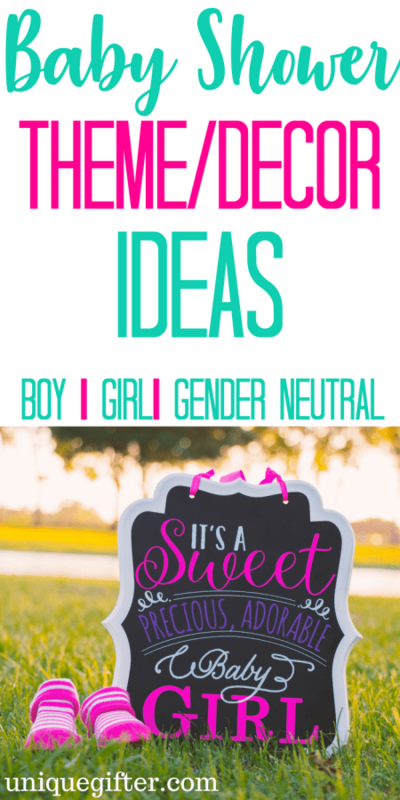 Whether you needing neutral, girl or boy themed I will have ideas listed below. A stunning decor theme for a perfect modern theme to welcome a baby girl into the world. You have a little tribal look and pretty floral prints. Love mermaids? If so you will love this gorgeous decor set that is all things mermaid in a perfect bundle of joy. Looking for a classic and timeless style, this bundle set is gorgeous! I love the colors together, it is simple but stunning. This kit has pretty much all you need to throw a party to welcome a handsome boy into the world. With table decor to balloons and things to hang on the walls to dress up any room. Looking for a fun nautical theme, then this set is a must. It has adorable ships, stripes and more. You can buy additional items to have everything look the same. Blue elephants are a classic theme that a lot of people love to do, and this set is really fun. It has quite a bit of the items you might be on the hunt for to pull your party together. Looking for a neutral theme, this gold and white is gorgeous and works for either a girl or boy, and even twins, triplets, etc. I love the yellow theme here, works perfect for either gender, is bright and fun, and really welcoming. This is a fun theme if you are a lover of animals. Add some cute cupcakes, and you are ready to make the mom-to-be feel extra special. Just because you are having a girl doesn’t mean you can’t have a woodland theme as well, here is a girl themed one, that is just as cute. Here is a fun little prince theme to welcome any little guy in a fun way. Shower the mom with love and gifts and make her day extra special. Have a boy baby shower in mind, then snag these fun mustache decor pieces! They are fun and adorable. These balloons add so much detail to a shower, and they are fun for sure. Perfect for any theme, and a great way to showcase it is a baby shower. Have a spot that guest knows where to put the gifts down! Add a tablecloth or a corner in the room, hang the banner and your ready to go. Having a rustic feel to your shower, check this out. These lanterns are darling, add some mason jars filled with colored candy, and a few more decor pieces and your set. Here is another combination of colors that is absolutely gorgeous. I love the look and feel of what a shower would be like using these pieces to decorate. Maybe your mom-to-be is having twins, a boy and a girl, or you don’t know the gender, this is a fun set to order. You have colors from both genders. Another stunning set to choose from, that has a more modern feel. Perfect for anyone expecting a girl. Add this cake topper to give it an instant Baby Shower makeover! Perfect for girl or boy! These are fun to have on hand for drinks or punch being served. It is just one more small detail to add even more pretty color to your party.